As I rode along the street, I noticed the park on the right. As most parks go, it has a fair amount of trees and green grass to accommodate many activities. I entered the gate, and after parking I walked up to a group of tables under a shelter to set up a row of many chess boards. I opened the demonstration board, and just then Dewain Barber (age 70) handed me the tripod. The chess sets were being set up, and I was about to do something that I haven’t done before. 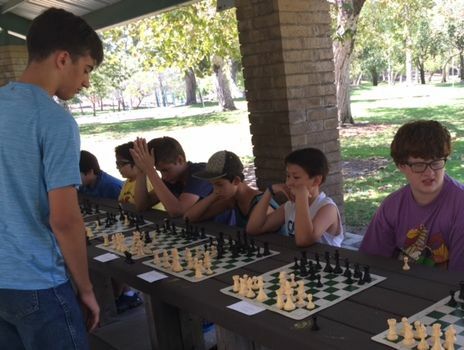 I had invited 13 students from my homeschool chess group to come and play in a tandem simultaneous. This is not an easy task because one of the presenters was age 16 (me), and the other was age 70 (Mr. Barber). I had trust in myself at age 16, but that old guy looked like he could forget where he put his car keys. Only time would tell. As the young people began to show up, I introduced Mr. Barber, and we agreed in advance that he would talk about the basic idea of controlling the center. I would follow by talking about development of the pieces to good squares. This worked out fine, and it was now time to play the simul. We explained to the kids that if you touch a piece, you must move it. We also told them that Mr. Barber would come to each board individually, make a move, then they would wait until I showed up to make their move. Once the kids’ faces produced the expression that a gunshot had just gone off, they understood the instructions. “You’re gonna play 13 games of chess all at once? 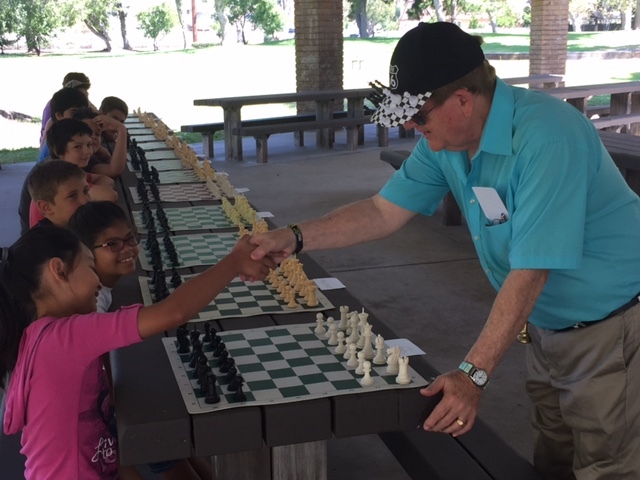 !” “Yes, John Mark, 13 games of chess.” So the games started, and Mr. Barber shook each of the kid’s hands, and he made the first move on each board. Once he got about half way, I followed by shaking each kid’s hand, they made their move, then I would make mine. “Control the C file…”, I repeated in my head. If there was one thing that I learned from Mr. Barber, it was to control the C file. Of course, after making my moves on each board, I would come back to the same board, and Mr. Barber would have made some super crazy move on the board. I’d think, “Um, Mr. Barber, I thought I had a queen on d3.” “What queen?” I guess he must have forgotten he was playing chess, and not sleeping on the couch. So we kept making our moves, and about half the kids were saying something like, “Oh, I didn’t see that knight.”, and I’d pause for a second, then I’d say, “Yes Liam, sometimes I forget about my right hand too. Move on.” Pieces on each board started to vanish slowly but surely. The look of confused faces began to steadily grow, and kings became more and more claustrophobic with the surrounding pieces sneaking closer and closer. Games started wrapping up. “That’s checkmate, my friend.” “Wow, I didn’t see that knight there on F3.” I’d say “Good game, man!” then hand them a golden queen. l to r Dewain and Steven making it happen. Down to the last couple of games, kids wondered who’d be the last one to survive. Up to this point, Mr. Barber and I won each game, so it became their contest to see who could survive the longest. And as I was looking over the last two boards, I noticed one player set up a very strategic defense. I then shortly found a very small mistake the player made after Mr. Barber made his move, and took advantage of it, which ended the game. With one player left, Mr. Barber and I cracked our knuckles, and focused our sights on the last player. Nobody had beaten us to this point. The last player was down material, so he needed to focus as hard as he could. We alternated turns, taking chunks of material out of the player as often as we could. Finally, a pawn passed, and it was over. All of the kids watched the last game with their golden queens on their boards. We shook the last player’s hand, and congratulated him on being the “last one to survive”. “Good game, we have our winner!” We shook his hand, and gave him… the golden king. We all agreed that we had a good time. The sun was shining, and it was a beautiful day outside. 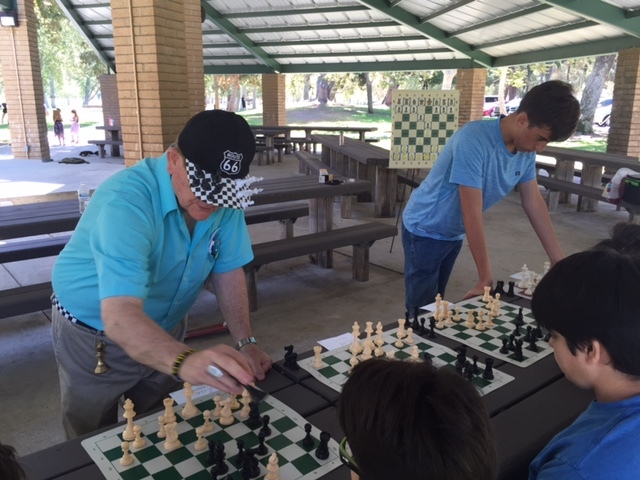 The day had only just begun, so we decided to enjoy the rest of the day, and park it in chess.